After a long lull, the gentle storm has come back. Food Bloggers Recipe Swap has been revived by fellow blogger Mireille who blogs at The Schizo Chef. If you’re looking for exciting International dishes, then her blog is the place to visit. Mireille decided that instead of just having the partners cook from each others blog, she mixed us all up. For example though I have to cook a recipe from Renu’s blog, Cook With Renu, she cooks from someone else’s. The reasons for making these idlis were, one I wanted to make some travel food and secondly though I simply love rawa idli, I had not made them at home. Her recipe just attracted me to try and I’m so glad that I did. Simple, easy and so delicious. The other charming thing about this recipe is that one can add any vegetables to the idli batter. I tweaked her recipe a bit by also adding some boiled peas. It took me hardly 20 minutes to make them. As I made them to enjoy them on our first train journey on the new SGR from Mombasa to Nairobi, I didn’t make any sambhar. Take it from me the cold idlis with the chutney just tasted awesome. A hearty breakfast on the the train. Without wasting much time lets get to the easy peasy recipe. Add ghee into a wide pan. Heat it over low heat. Add semolina and roast it for about 2 minutes. Take the pan off the heat. Let the semolina or sooji cool down completely. Add the semolina to a bowl. Add chopped chillis, ginger, salt, vegetables, water and yogurt. Mix well till the mixture has no lumps. Heat the 1 tbsp oil in a small pan over low heat. Add chana dal and roast it till it begins to turn light brown in colour. Add the urad dal and roast till it changes colour. Add mustard seeds, curry leaves and coriander. Mix and let it sizzle for a few seconds. Add asafetida and immediately pour the tempering into the batter. Mix well. Let the batter rest for 10 minutes. Prepare the idli steamer, add water for steaming. Grease the idli molds with oil. When the water begins to boil, add Eno to the batter and give it a good mix till its appears fluffy. Using a ladle, fill the idli molds or cavities with the batter. Steam the idlis for 10 minutes. Remove the mold from the steamer. Let the idlis cool down a bit about 5-10 minutes. Using a butter knife or a thin spatula, carefully remove the idlis from the mold. Serve the idlis with your choice of chutney and sambhar or vegetable stew. The batter should not be too dry or too watery. Add vegetables of your choice like finely chopped French beans, corn, finely chopped spinach etc. Add nuts if you like. For travel purpose I chopped the idlis into quarters which was so much easier to enjoy with a fork. Check Renu’s blog to see what an idli steamer looks like. I highly recommend that you add the tempering as that makes the idlis taste completely different. Many people presume semolina is gluten free, but its not. For vegan option omit dairy yogurt and replace it with vegan yogurt. Thanks Rafeeda, I too have eaten them out so so so many times and can’t believe that its so easy to make them. I love rava idlis! Love how you have made them nutritious by adding various veggies to them. The idlis look so soft and delicious! Thanks Priya, they did turn out really good. Thanks Renu.. Will have to check out your instant idli, getting hooked to the variety of idlis. I can imagine everyone else snacking on junk food on the train while you enjoy these delicious idli’s – your breakfast was much healthier than theirs I am sure 🙂 – btw I absolutely LOVED LOVED LOVED the githeri I cooked from you! Mireille never thought go that, come to think of it ours was a healthy breakfast while others were snacking on cookies and chips for breakfast! I’m so glad you loved the githeri recipe. We too love this wholesome meal. 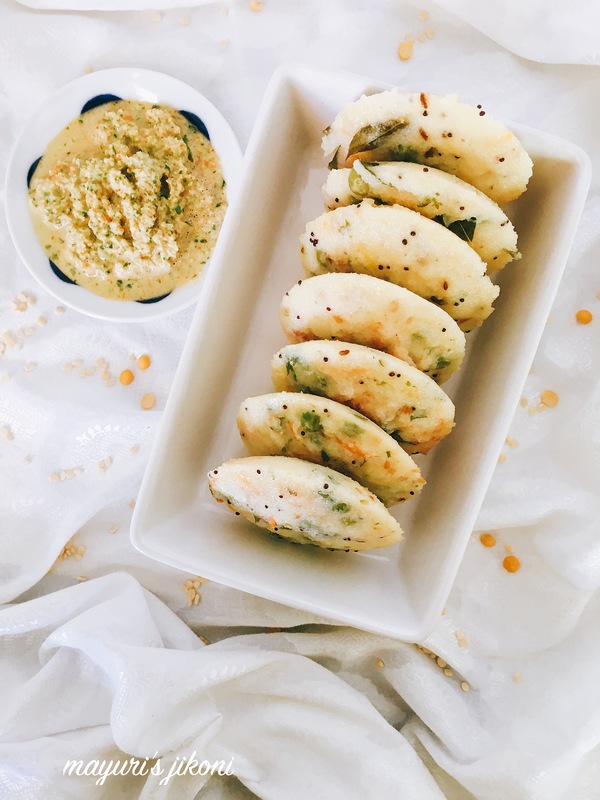 These idlis looks super delicious nad I like the addition of the vegetables to the batter.These would make a lovely and healthy snack dish. Simply mouthwatering and super healthy snack.I love the addition of the vegetables to the batter. Rava Oslo looks scrumptious…it’s amazing to start the day off with this nutritious and delicious breakfast. I’ve never made idlis – I am so happy to be part of this group and get to learn more about so many awesome recipes! You make this sound easy – I will definitely add it to my list of recipes to try out this year! Please do try it Ali, if you love international cuisine then you’ll love this breakfast treat. Instant semolina idli makes me week at knees, especially with coconut chutney! Loving it with many veggies as it becomes wholesome dish. Thanks Jagruti. It is a really healthy breakfast treat. Mayuri I have been drooling over the idli images since they have turned on my FB yesterday! in fact I have made so many mistakes typing out this message all because I cannot help looking back at the pics. I love the idlis Mayuri they are amazing and my favorite as the need minimum preparations. Thank you so much Archana. I’ve always loved rava idli but didn’t know that it was so so so easy to prepare. I love this instant rava idli and will make them in a blink of a second. It is my to go dinner when I am out of ideas to make. I have added carrots before but not tried green peas. Will give it a try next time. Thank you so much Sandhya, hubby is asking me to make the idlis again. This is another dish I keep making often. Yours look so delicious and an ideal travel food. Thanks Jayashree, we loved it as travel food as cold idlis tasted as good as the hot ones. Instant semolina idli !! WOW WOW 🙂 Also the addition of veggies here are making it much wholesome dish. Thanks Sasmita, I love veggies filled idlis. Delicious Idli Platter loaded with goodness of veggies. I love instant recipes as they come in handy when i am late from work.